If you talk with anyone who has spent time in a classroom, and you asked that person if core academic subjects were the only things students learned in school, the resounding answer would be “NO.” So much more is taught at school than correct grammar and times tables. Students are learning life skills each day and they are learning how to interact and connect with other people and their environment. The personal and interpersonal life lessons students are learning have a specific name— social-emotional learning (SEL) —and these skills are a large variable in the equation of a fulfilling life. 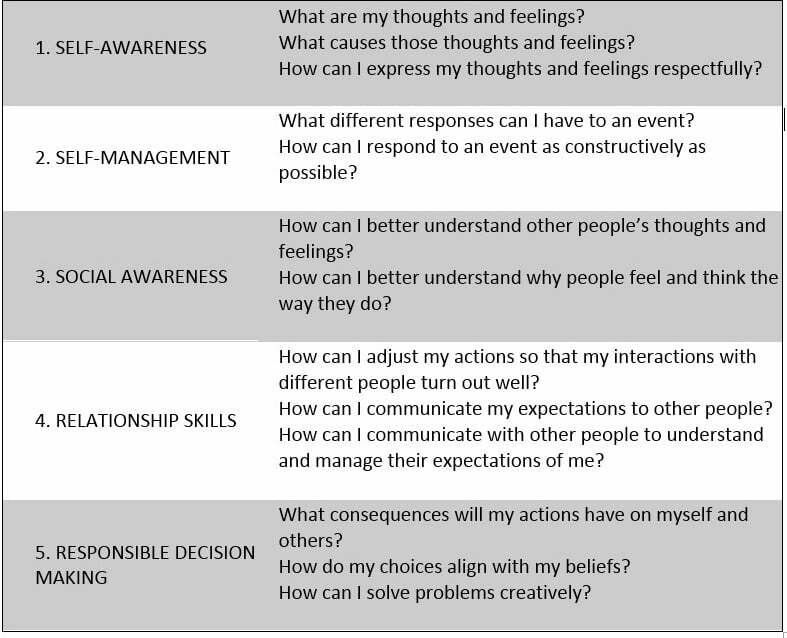 Researchers generally agree upon five key competencies of SEL (social-emotional learning) (Durlak, Weissberg, Dymnicki, Taylor, & Schellinger, 2011). 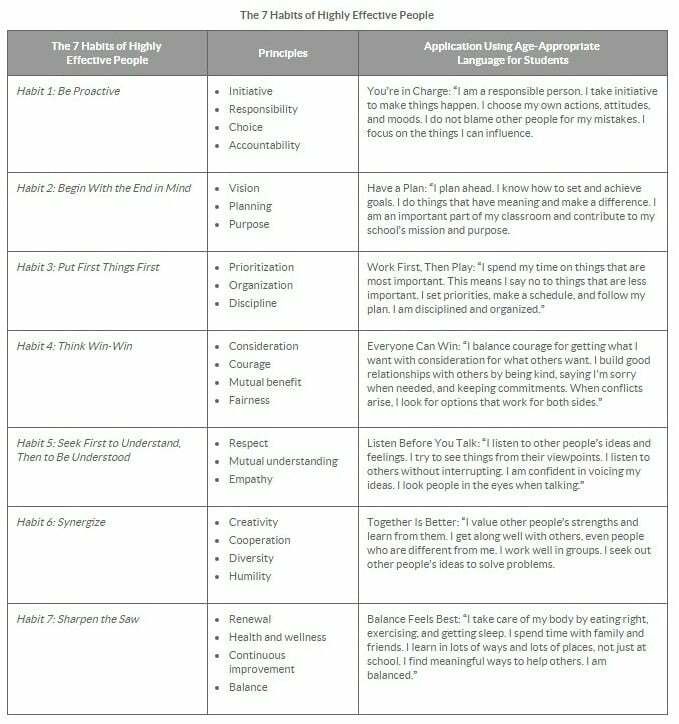 These competencies provide the foundation for maintaining high-quality social relationships and for responding to the challenges of life. After reading the chart above, we can probably all agree that gaining a quality social-emotional education is just as vital to our students’ long-term success as academic education. 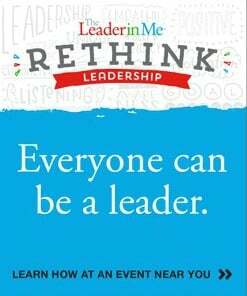 The Leader in Me utilizes and integrates several leadership, social-emotional learning, quality, and educational models and processes from past and current thought leaders including The 4 Imperatives of Great Leaders and The 4 Disciplines of Execution. The 7 Habits of Highly Effective People is also a key component of the overall Leader in Me process and is a synthesis of universal, timeless principles of personal, interpersonal, and organizational effectiveness such as responsibility, vision, integrity, teamwork, collaboration, and renewal. 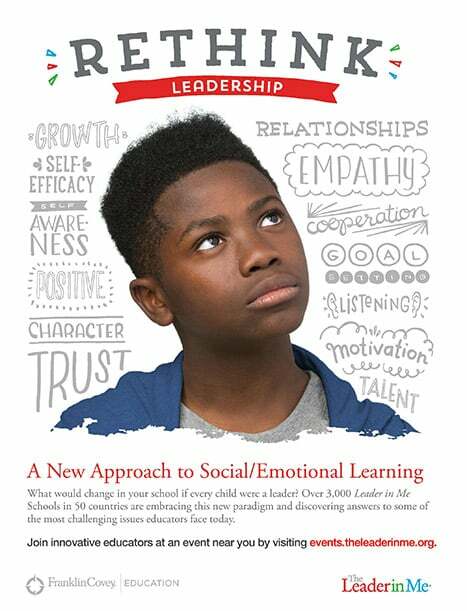 The 7 Habits are teaching students critical social-emotional skills and helping students hone their interpersonal skills in a safe and supportive environment. The school-wide structure of the process and the Paradigm Shift that every student is a leader provides ALL students with a place to thrive. If you would like to be a part of more discussions on topics like this, please visit our “Events” page to find a Symposium near you.